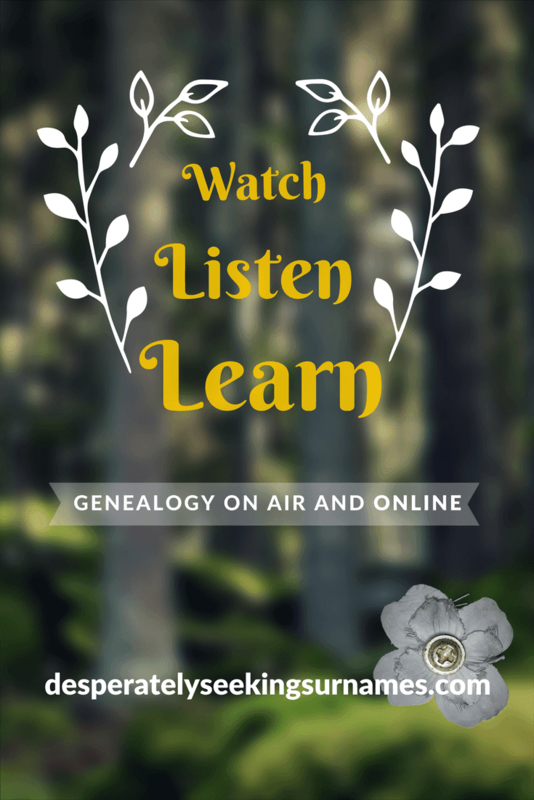 This Watch, Listen Learn series highlights audio and video content in the genealogy and family history world. 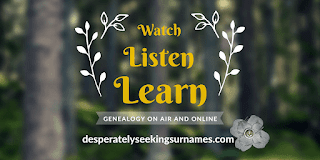 Each year, more an more genealogy related education becomes available to us via improvements in and access to technology. The amount of knowledge and entertainment that can be accessed from online audio and video content is growing daily. Search for virtually any topic and you are likely to find a Podcast or YouTube video on the subject. 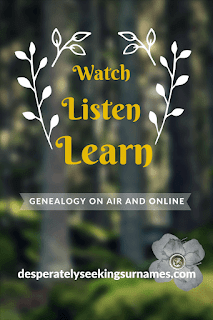 Webinars are a great teaching medium and many genealogy societies provide this service for free to members or for a limited time to non-members. To help you break through the noise, I will spotlight podcasts I have listened to that I found to be above the norm, YouTube videos that teach as well as webinars and livestreams I've watched. The episodes I highlight could fall into any or all of these categories. If you are new to podcasts, give them a try. I personally use the Podcast Addict app on my Android phone. Videos, livestreams as well as webinars are generally viewed through your desktop or via a mobile app. To assist with deciding which episodes may interest you, many publishers will provide show notes or time stamp the video for you. Often the show notes will include the links to sites that are discussed during the show. You can think of the show notes as a blog post which you may prefer to read if listening isn't your cup of coffee. A time stamp, will allow you to start watching at a specific point in the video. This is helpful if you want to re watch a portion of the video that you found particularly interesting. I understand that the process of time stamping a video is time consuming and why many publishers do not do this. Webinars generally provide an overall description of the content to be presented and may or may not come with a handout. The goodness in a handout is usually the URLs of the sources the presenter refers to during the webinar are provided. 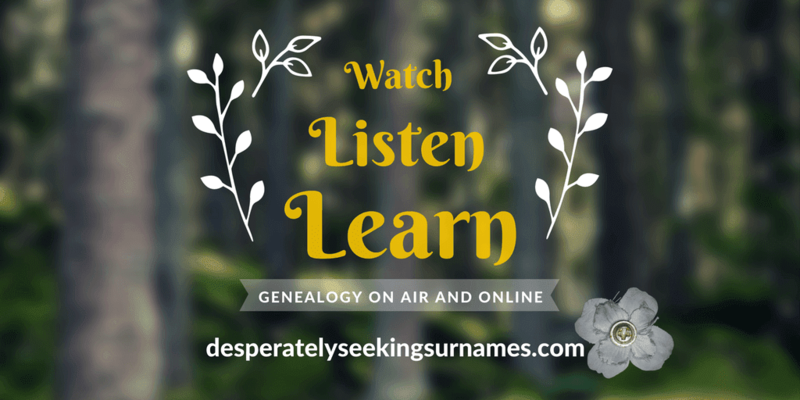 This is a two-part spotlight from a 2010 episode of Genealogy Gems with Lisa Louise Cook interviewing Dr. Robert Leonard a forensic linguist. Take note that the content I am spotlighting is not necessarily the most current episode. These are episodes I feel are worth listening to, some from several years ago. I point that out as any breaking news, functionality and technology mentioned may have changed since the episode aired. Visit my Pinterest board For Podcast Junkies Like Me to get a jump start on listening to episodes. Pin this post for later and please share so those that spend their time and effort creating this content for us can get more and more listeners and viewers. I hope to see many of you this weekend in Columbia, Missouri. 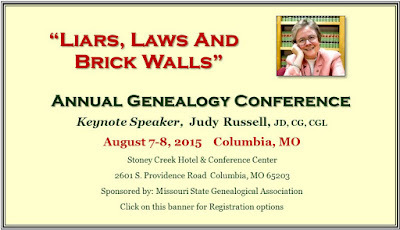 The 35th Annual Missouri State Genealogical Association's Conference is sure to be a success with Judy G. Russell, The Legal Genealogist, as our Keynote Speaker. My 2014 Conference posts still apply. 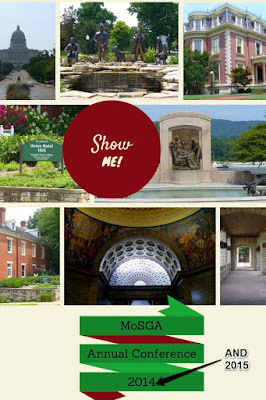 I hope you enjoy hearing a bit about what Missouri has to offer in the way of genealogy research. Read on for my top four reasons to attend. If you failed to pre-register, no worries, you may register for the conference at the door Friday and Saturday morning. For more details visit mosga.org. See you soon!